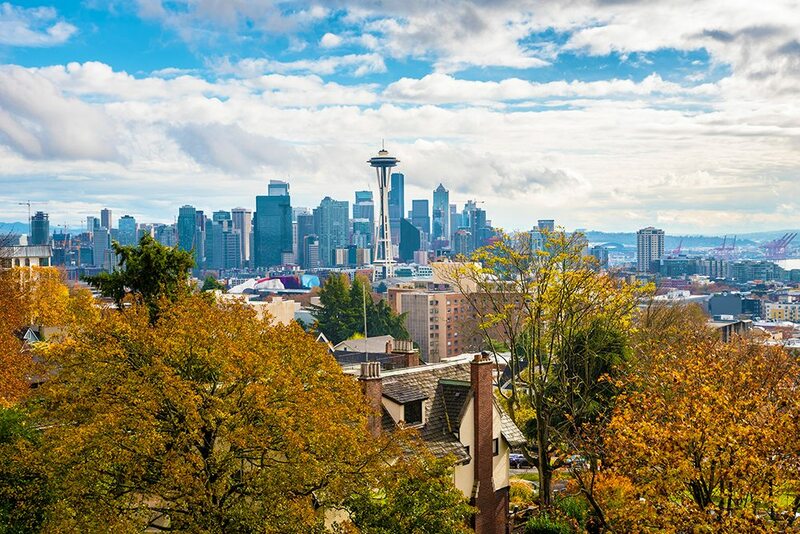 Sure, it’s called the Emerald City because all of its gorgeous, year-round greenery—Douglas Firs, Western Red Cedars, Hemlocks. But its abundance of other plant varieties make it the perfect place to view fall colors. If leaf-crunching isn’t your thing, check out one of the city’s many fall festivals. Grab a bite to eat at a food truck fair, or build your own replica of the Space Needle with Legos. There’s all kinds of fun to be had in Seattle in the fall. Tucked in the Southern neighborhood of Rainier Beach, Kubota Garden is a 20-acre Japanese-style green space complete with ponds, waterfalls, and a bamboo grove. In the fall, if you time your visit to align with golden hour, the park’s Japanese Maples put on a sun soaked show of color and light. Forget about trying to track down your favorite food truck in downtown Seattle during the lunch rush hour. On November 18 or 19, head over to Magnuson Park on Pontiac Bay, Lake Washington for Trucktoberfest. A list of participants has not yet been released, but you’re sure to find a variety of different fare, and a nice grassy spot to picnic. If you grew up identifying as a “Legomaniac,” chances are you won’t want to miss Seattle’s 16th annual BrickCon. On October 7 and 8, at Seattle Center’s Exhibit Hall, thousands of models created by Lego hobbyists from around the world will be on display–available for both your purchase and admiration. If you’re feeling inspired, visit the event’s Building Zone– stick ‘em, stack ‘em, and become a kid again. On November 11 and 12, head to Pier 91, Smith Cove Cruise Terminal, and sample from over 60 artisan artisan chocolate makers from all over the world at the Northwest Chocolate Festival. The only thing that could make this festival better is if each sample were accompanied by a taste of one of Washington’s famed red wines.